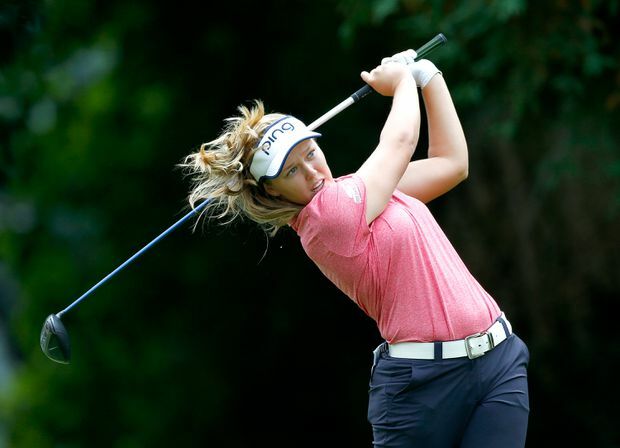 Brooke Henderson of Canada hits a shot during the first round of the LPGA Cambia Portland Classic at Columbia Edgewater Country Club on Aug. 30, 2018 in Portland, Ore.
Marina Alex matched the course record with a 10-under 62 on Thursday to take a two-stroke lead over Canadian Brooke Henderson and Minjee Lee in the Cambia Portland Classic. With Stacy Lewis unable to defend her title as she prepares for the birth of her first child, Alex is using her friend’s caddie, Travis Wilson, at Columbia Edgewater. “Got my ball-striking together and it was awesome,” Alex said. Henderson, the 2015 and 2016 winner from Smiths Falls, Ontario, birdied five of the last six holes for a 64. The 20-year-old star is coming off a victory Sunday in the CP Women’s Open on home soil in Regina. Women’s British Open champion Georgia Hall matched Su Oh at 66. Inbee Park, playing for the first time since the Women’s British Open, opened with a 69 playing alongside Thompson and Shanshan Feng (72). There are five other Canadians in the field. Brittany Marchand of Orangeville, Ont., opened with a 3-under 69. Hamilton’s Alena Sharp and Quebec City’s Anne-Catherine Tanguay (72) are even while Charlottetown’s Lori Kane (76) and Maude-Aimee Leblanc of Sherbrooke, Que., (78) are well back.